Cacao made with love Reverence and a very pure connection. Her intuition is so spot on, I cry every time I receive a package, and experience radical shifting thereafter. 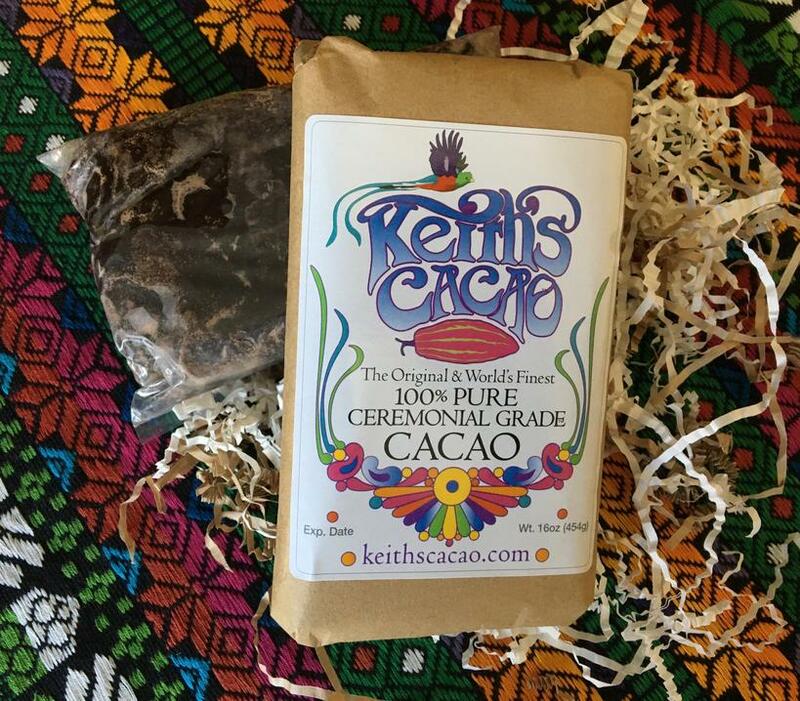 You may purchase custom made 'Bliss Balls' or a pound of ceremonial cacao paste from Keith's Cacao. I invite you to a transformational gathering working with cacao and stone medicine (gems + minerals). This is a multi-layered weaving of vibrational energy for healing, connecting to our hearts and community. We'll be working with wild, ancient strains of cacao harvested and processed in the traditional Mayan manner. This cacao contains significant levels of neuromodulators and neurotransmitters like serotonin and is loaded with around 1200 constituents. It also acts as a vasodilator, increasing blood flow and oxygen throughout the body and brain by up to 40%! This is experienced by heightened sensations, greater lung capacity, incredible mental clarity and grounding into the body. And of course, heart connection. 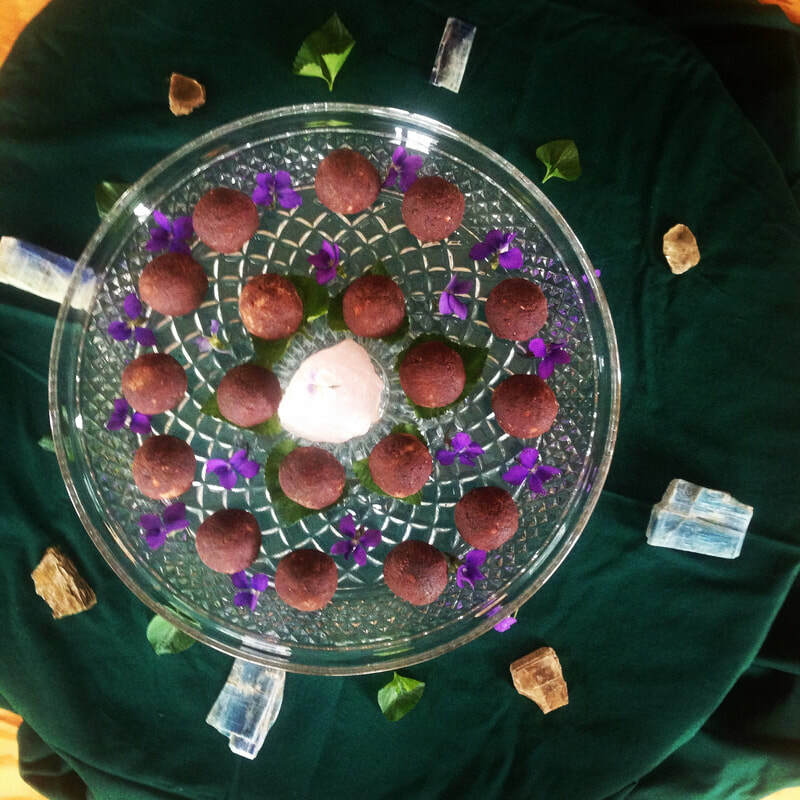 I craft 'Bliss Balls' with this cacao and infuse it with my Spirit Remedies geared towards the intentions of our Circle and those participating. 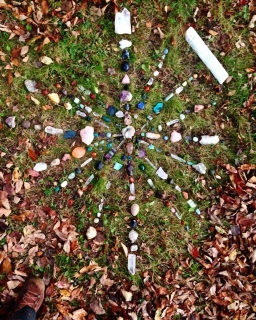 After studying some foundational Taoist Stone Medicine from the Jade Purity Lineage while recently living in Appalachia, I now pair these ceremonies with on the body Stone Medicine Treatments, a central stone grid and open channel my Spirit Language (or what others call 'Light Language' or 'Speaking in Tongues') for a powerful alchemy of transformation! Everything that exists has a specific frequency and these tools weave together in a dynamic manner! This is truly a multi-layered and multi-dimensional experience! I love creating a safe, beautiful and loving container for my Ceremonies. Specific Details will be emailed a few days prior to our Ceremony. Lorin Purifoy, B.A., Vibrational Medicine Practitioner, Licensed Massage Therapist (15726), Owner + Formulator of Sacred Ways Apothecary and Purifoy Spirit Essences, Cacao, Workshops, Retreats. Spiritual exploration partnered with cacao! Yes, chocolate! But not just any chocolate. I work with wild/indigenous strains of cacao loaded with neurotransmitters and neuromodulators such as theobromine and seratonin. This is a gentle entheogenic plant medicine that will partner with you for profound shifts. I'm thrilled to be able to offer these transformational healing circles! In 2012, I was sought out by the Spirit of Cacao to begin offering intentional circles working with the plant medicine of cacao. I'd never experienced this before, but within 3 hours, I'd been connected with Keith, widely known as the 'Cacao Shaman' in Guatemala. 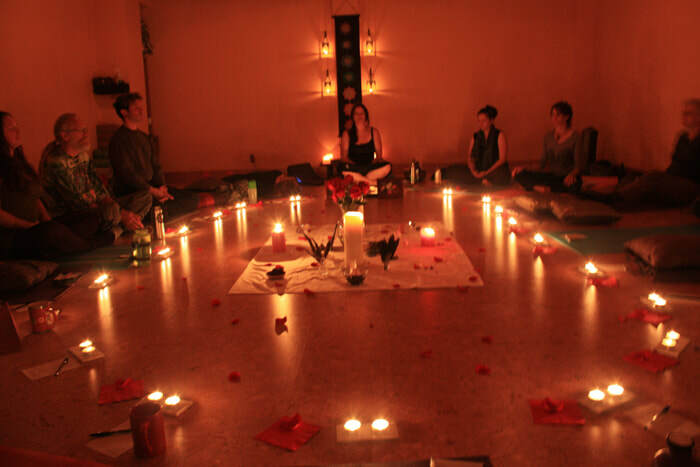 2/22/12 I held my 1st Circle and was humbled and grateful to be partnered with such a heart expansive and gentle ally to support inner growth, creative flow, communal heart connection and deeper self love. Forward to 2018. A part of my current work is with Intuitive Stone Medicine, influenced by the Jade Purity Lineage. As I've been working more intimately with stone grids and stone medicine, the Cacao Spirit began calling strongly to be paired with the deep soul level healing stone medicine offers. 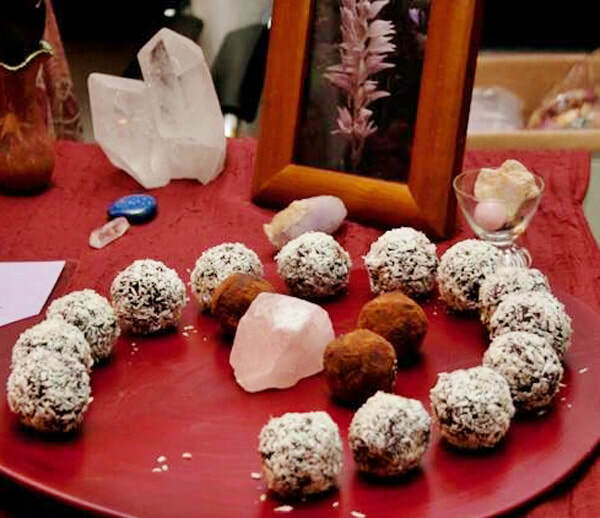 These are multidimensional, experiential healing circles paired with cacao, stone medicine through a central crystal grid + body treatments, my spirit language channeling, ritual and Purifoy Spirit Remedies geared towards a specific focus of healing for each Ceremony. This combination of potent earth medicine allies will support your own inner exploration and growth. 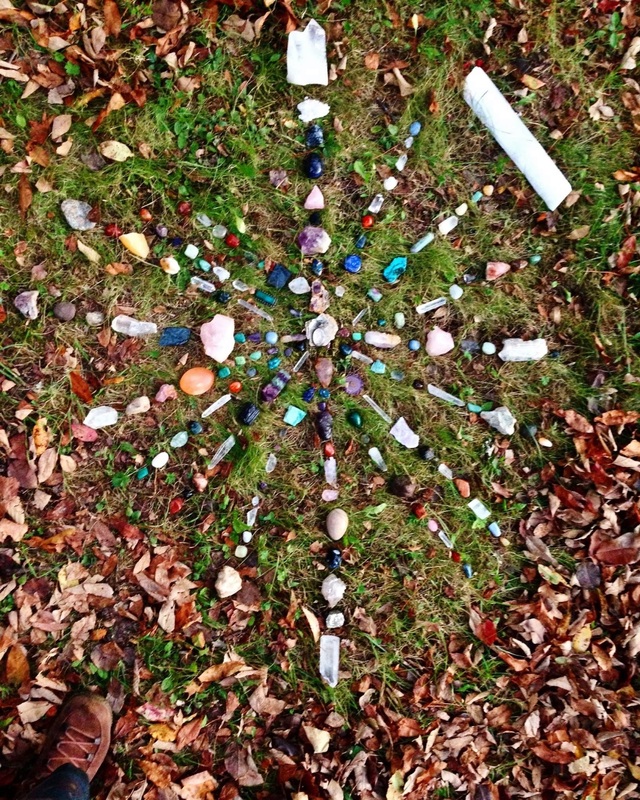 "Thank you Lorin for creating a beautiful and powerful sacred space for our return to love in our bodies and our relations...our true nature. I was connected to a deep soul longing for embodied love in a meditation I was leading at Intel yesterday afternoon (before the ceremony) and could feel the powerful intent of the ceremony at work throughout the afternoon. I could feel something powerful rising in me that I both deeply longed for and had deeply resisted and suppressed...maybe for lifetimes. I continued to meet it throughout the afternoon...I knew I had to come to the circle even though I was meeting this resistance as pain in my body. I know this was the collective intention at work....alchemizing fear...rising love. I left last night in a rush to get home as the appearance of the migraine symptoms continued to grow in the ceremony...I am now drinking water and allowing this continue to move in me...it is deep...deeper than emotional...ancient DNA/psyche stuff...collective and personal. The desire for authentic presence and communion with my self and life and others in true love...and the longing for that in an intimate partnership with my own essence and to have that experience in embodied love with my soul's partner. I opened a deep reservoir that love had not touched yesterday...and allowed this aspect of my essence to speak. Thank you to everyone for being present for your own being and becoming and for holding a space for this to unfold for me. Love to you Lorin ...it was beautiful to receive your goddess/priestess love, guidance, wisdom and beauty. Honored to be in your presence! Love to all~"
©2019 Lorin Purifoy and Purifoy Spirit Essences. All Rights Reserved.